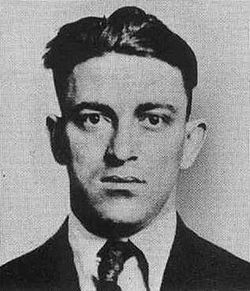 However, the violence that lead to this unprecedented level of criminal success drew the retaliation from Capone's rivals, particularly his bitter rivalries with North Side gangsters lead by Hymie Weiss and Bugs Moran. He had his car riddled with bullets more than once. In a particularly unnerving incident on September 20, 1926, the North Side gang shot into Capone's entourage as he was eating lunch in the restaurant of the Hawthorne Hotel. A motorcade of ten vehicles, using Thompson Submachine guns and shotguns riddled the outside of the Hotel and the restaurant on the first floor of the building. Capone's bodyguard (Frankie Rio) threw him to the ground at the first sound of gunfire and laid on top of "The Big Fellow", as the headquarters was riddled with bullet holes. Several bystanders were hurt from flying glass and bullet shrapnel in the raid, including a young boy and his mother who would have lost her eyesight had not Capone paid for top-dollar medical care. This event prompted Capone to call for a truce. Negotiations fell through. These attacks prompted Capone to fit his Cadillac with armor plating, bullet-proof glass, run-flat tires, and a police siren. Every attempt on his life left him increasingly shaken by Moran, who was almost certainly involved in most of the attacks. This car was seized by the Treasury Department in 1932 and was later used as President Franklin D. Roosevelt's limousine. Capone placed armed bodyguards around the clock at his headquarters at the Lexington Hotel, at 22nd Street (later renamed Cermak Road) and Michigan Avenue. For his trips away from Chicago, Capone was reputed to have had several other retreats and hideouts located in Brookfield, Wisconsin; Saint Paul, Minnesota; Olean, New York; French Lick, as well as Terre Haute, Indiana; Dubuque, Iowa; Hot Springs, Arkansas; Johnson City, Tennessee; and Lansing, Michigan. As a further precaution, Capone and his entourage would often suddenly show up at one of Chicago's train depots and buy up an entire Pullman sleeper car on night trains to places like Cleveland, Omaha, Kansas City and Little Rock/Hot Springs in Arkansas, where they would spend a week in luxury hotel suites under assumed names with the apparent knowledge and connivance of local authorities. In 1928, Capone bought a 14-room retreat on Palm Island, Florida close to Miami Beach. In a scheme that had Vincent "The Schemer" Drucci written all over it, the Northsiders struck back on September 20, 1926. From the intelligence he had gathered from kidnapped Capone bodyguards and drivers, Weiss knew Capone liked to stop at the Hawthorne Restaurant in Cicero, the town abutting West Chicago that Torrio and Capone took over in 1923. Along the 4800 block of West 22nd Street, a eighty-foot wide boulevard with two streetcar tracks and two-way traffic, were hotels, offices, banks, stores, and throngs of people shopping or in town for the opening of the horse racing season at nearby Hawthorne Park. The Anton Hotel, operated by Capone's organization, was on the block. On Monday September 20th, Al Capone and one of his toughest bodyguards, Frankie Rio, sat together at a back table in the Hawthorne Restaurant, facing the front door for the obvious reasons of security. The place was full, with an estimated 60 people at the tables and lunch counter. No doubt Capone had his usual complement of perimeter security people stationed in the restaurant and outside. With a pre-arranged signal (probably a Northsider operative in a phone booth amid the throngs of people on the sidewalks), a single speeding car raced down 22nd Street at 1:15PM, toward the Chicago city line two blocks away. It looked like a police flivver (car), with a mounted gong clanging loudly in the manner of 1920s police cars. When the sound of machinegun fire was clearly heard, Frankie Rio pulled Capone to the floor and reached for his gun. But as the car sped by the Hawthorne Restaurant, a Thompson machinegun chattering away through a window, there was no evidence of any damage-- no shattering of hotel or restaurant windows, no splattering of lead against building walls or sidewalks. Nevertheless, patrons in the restaurant headed for the back exits or hugged the floor; as the car sped off, some started to get up to peer out the windows.